Want to see this beautiful pottery being made in person? 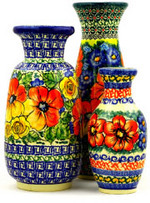 Many of our customers have been to Boleslawiec and became hooked on Polish pottery because they saw with their own eyes how much craftmanship and artisanry is put into each and every piece. Ask anyone who’s visited the city and it’s surrounding areas, and you won’t be able to stop them from talking about the beauty of the Polish countryside and it’s obvious impact on the people who create this earthy stoneware. A trip to Boleslawiec is truly a memorable experience — and when you bring some pottery home with you, it’s one you’ll not soon forget. Let us be your guide to the ultimate Polish pottery shopping experience in Boleslawiec!